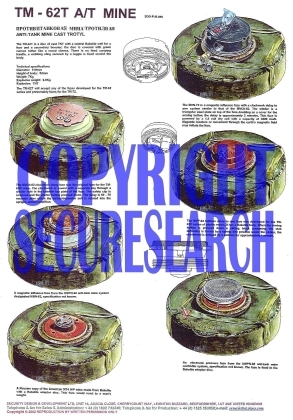 This security poster illustrates the TM-62T Russian Anti-Tank Mine. This anti-tank mine is one in a series of ‘TM-62’ series mines, and this version uses a cast Trotyl (TNT) charge covered in dark green canvas. When fitted with the MWP-62 fuze, the anti-tank mine is described as a minimum metal version. This anti-tank mine can be fitted with a variety of fuzes common to the TM-62 series of mines. This security poster features the TM-62T Russian anti-tank mines’ specifications. This security poster also shows TM-62T anti-tank mines with the MVN-72 magnetic influence fuze, the MVCh-62 clockwork delay fuze, the MVN-62 bellow delay to arm fuze, the UMPN-68 magnetic influence fuze, an electronic pressure fuze from the UMPN-68 anti-tank mine controller system, and a Russian copy of the American M14 A/P mine. All these illustrations contain explanations and descriptions of the fuzes paired up with the TM-62T on this security poster. A TM-62T with the MVN-72 magnetic influence fuze, along with an explanation of the fuze. The MVCh-62 clockwork delay fuze with the TM-62T, along with an explanation of the fuze. A TM-62T with the MVN-62 bellow delay to arm fuze, along with an explanation of the fuze. The UMPN-68 magnetic influence fuze with the TM-62T, along with an explanation of the fuze. A TM-62T with an electronic pressure fuze from the UMPN-68 anti-tank mine controller system, along with an explanation of the fuze. A Russian copy of the American M14 A/P mine as well as a description and explanation of the fuze with the TM-62T. The TM-62T Russian anti-tank mines’ specifications. This security poster features the TM-62T Russian anti-tank mines' specifications, and TM-62T anti-tank mines with the MVN-72 fuze, the MVCh-62 fuze, the MVN-62 fuze, the UMPN-68 fuze, a fuze from the UMPN-68, and a Russian copy of the American M14 mine and descriptions of these fuzes.